Shopping for and Choosing Infant and Toddler Shoes: Oh, the Places You Can Go!! Choosing and buying shoes for your child can be an overwhelming and expensive endeavor, especially because each developmental stage and seasonal change brings forth a new selection of shoes, boots and slippers. I love shoes – as you will find out below – and it’s been fun for me to buy my daughter shoes. Here are a few tips and some pointers from someone who is way too familiar with the infant-toddler shoe scene! Infant shoes (also called crib shoes) are the little leather slipper type shoe that the baby wears up until he or she can walk and a little past that point. In my opinion Robeez are probably the best but part of that is because I didn’t buy other brands. I did have one pair of non-Robeez crib shoes. They were from Target and were given to me as a gift. They were cute and comfortable but they didn’t last very long. The leather on top started peeling off and they wore out VERY quickly. They did not hold up well compared to the Robeez. A friend of mine swears by the Soft Star shoes. She had her boy in them from the time he was crawling until he started walking and then she bought him another pair. They were the only shoes he wore. According to their website, the company is “passionate about minimal footwear for healthy development of bones, muscles and balance.” They make all of their shoes by hand. 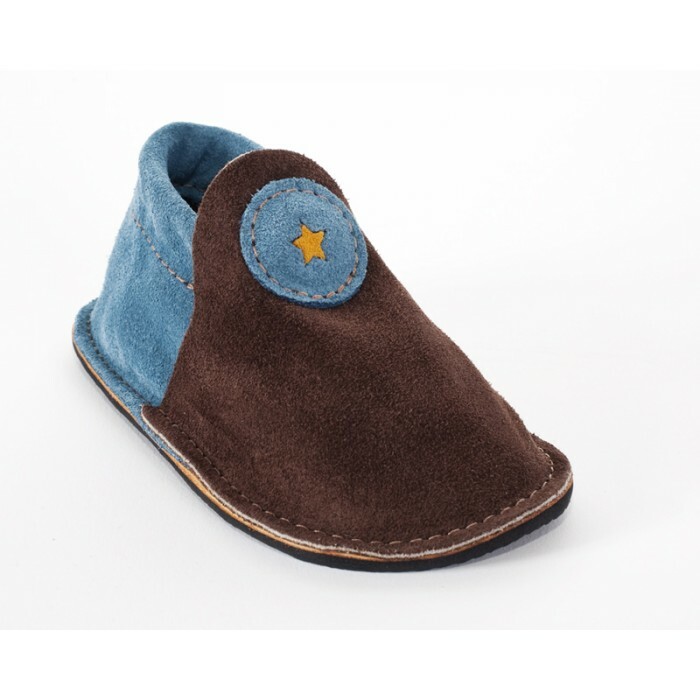 The Soft Star mocassins are described as having “soft suede uppers and our strong, soft suede sole…[with] genuine sheepskin innersoles that keep the foot protected, dry and comfortable. Sheepskin is nature’s heat regulator – and keeps feet dry in the summer, and cozy in the winter. Inner elastic hugs the ankle which makes the shoe easy to slip on, and they stay on.” You can also design your own but that would just leave me feeling completely overwhelmed! They also have an option for regular or wide so if your child has wide feet this might be the place to go. I think they also will use an outline drawn of your child’s foot if you are custom ordering. I also just noticed while researching for this post that they have “classroom shoes” and Waldorf or Montessori shoes. That kind of cracked me up—But then I ordered a pair! My girl is starting at Montessori preschool in a couple of months and doesn’t have any soft-soled shoes. The kids don’t wear their street shoes in the classroom so I figured it’d be a good way to go. I got a pair on clearance for twenty-something. When the babies start walking outside you can still put Robeez on them but realize the soft leather will wear out very quickly on the cement and other hard surfaces. 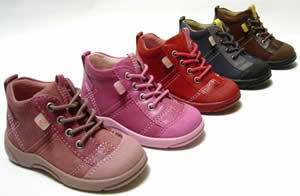 There are some models of Robeez shoes that have a sturdier bottom and they are better for walking outside. We had a pair with sheep on them that my daughter LOVED. She liked them so much that we ended up buying a second pair when she outgrew the first pair. They held up really well. In part because of the thicker bottom, which was still quite flexible but doesn’t wear out like the soft leather. We both LOVED the Riley Roos that I bought her, even more than Robeez. They were by far my favorite of all of her shoes. 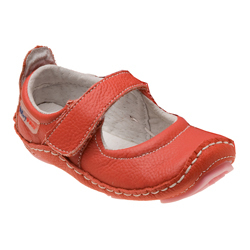 The orange Riley Roos shown below are the exact shoe we had, except we had them in brown. They are comfortable and soft and have a sturdy bottom. She wore them until her toe was all the way up to the end of the shoe! Here’s a pair of the Soft Star shoes that look like they have a sturdier sole. Soft Star also makes shoes for adults. I think they also have a sale once a year where the percentage off starts out low (like 10%) and then increases as the end of the sale nears. 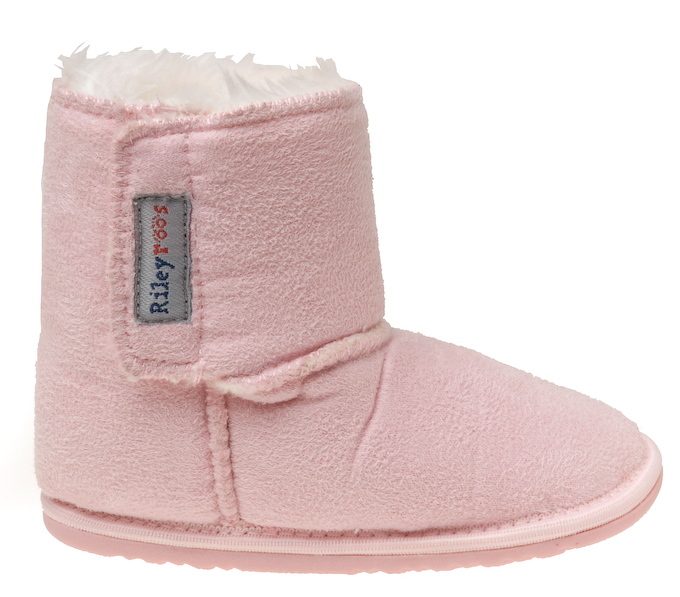 We also had these pink Riley Roos boots. She wore them quite a bit. They were very cute and comfortable but they did not hold up very well. They leather pulled away at the seams. They were good for the one winter season but have pretty much come apart to the point that I can’t resell them on Ebay. We also had these Robeez boots. I loved them. They were soft and supple but had a lot of warm foot coverage. 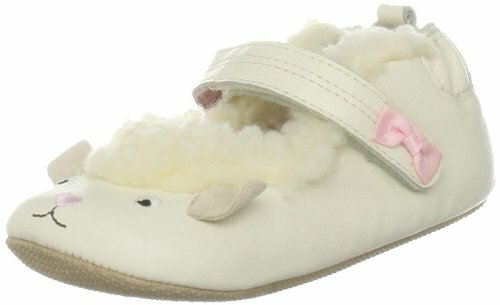 They looked really cozy and if they made them for adults I would totally buy myself a pair. They also come in pink. I’m surprised I didn’t have them in both colors! Of course, when the snow starts to fall, you will need a pair of snowboots. I don’t recommend spending a lot of money on snowboots but there’s one thing you have to watch for…Access into the boot! If there’s a once inch zipper that goes down and you’re expected to cram a moving child’s food into it, don’t buy them. Look for boots that have zippers on both the left and the right side of the shoe or some way that the tounge goes WAY down. The more you can open up the boot the better, otherwise you’ll be banging and pulling and tugging and pushing trying to get your child’s foot down into the boot and ultimately you won’t know how successful you are because they can’t tell you. You’ll know when they get up and start walking and trip over the boot and land on their face. Then it’s back to the drawing board. It can be quite frustrating, amusing and time-consuming. Oh, and if the kid isn’t into having the boot put on in the first place, good luck. The meltdown will just be prolonged and you’ll end up carrying your child to the car and throwing the boots in the back seat. My advice: Find a boot that opens up!!!! 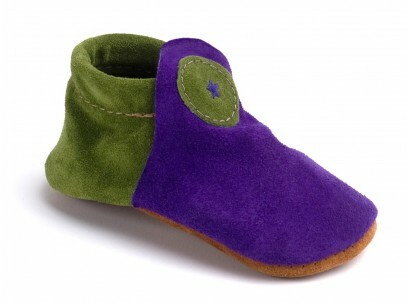 Honestly, I have not found a pair of slippers that I have liked for my child, either as an infant or a toddler. For infants, I have found that socks with good ribbing around the ankle are the best. As for toddler slippers, 90% of them have either fallen off or ended up around her ankles as she was running around. Maybe that’s because she has skinny feet. Not sure. She does have a pair of Elmo slippers from Target that have worked out well. They stay on and they are cute. They have an enormous amount of ribbing around the top which might be why they stay on. The Minnetonka Moccasins did not work for us either. I had one pair that I couldn’t get on her feet – they were too tight in the toes. Another pair wouldn’t stay on her, even with socks. I prefer close-toes sandals to open-toed just because the open toe can get hung up on surfaces causing them to trip and fall especially on the playground. I bought my daughter these Nike sandals this summer because they were so darn cute. She loves them. They are even a little bit long for her yet they stay on. They’re made from a neoprene type of material so they are quite good in the pool or the lake. They are close-toed so she can go on the playground in them. Plus they look good even when she’s wearing a little dress or a shorts outfit. I’m not a fan of Crocs even if they are super cute; they don’t really seem to stay on or to be that practical. On playground equipment they seem to be too loose and unsafe. Keen makes great sandals and shoes but they tend to be too wide for my girl’s skinny little feet. They are great for our roommate’s two and half year old chubby little feet. I bought the blue tennis shoes below from Sierra Trading Post and they were too wide so my roommate’s little boy acquired them and they fit just right. My girl loves the Mary Jane style of shoes that allow her to pull the strap over and velcro them herself. The Robeez sheep shoes and the Nike summer sandals are both like that and have been her favorite shoes. I can go tell her to put on her shoes and she does it all by herself. Babies-R-Us has a very cute selection of shoes and you can usually find them at a good price on sale especially at the end of a season. I bought a couple of cute pairs of velcro tennis shoes when they were having a good sale once. I just bought a pair of pink converse for my baby girl at Target for $12.99. We have a lovely pair of Ecco brand lace up shoes that are great for walking, especially if you’re going to be outside or in colder weather. She does wear them quite a bit but on several occasions when I went to get her out of her carseat I found she had removed the laces and had thrown them on the floor. Here are the Ecco first walk shoes. New they are quite expensive. The walkers below are $58.00 but I’ll tell you, they are really good shoes! The leather is both sturdy yet flexible and they seem to fit the foot really well. The place I have gone to most for shoes has been Ebay. I also resell her nice shoes on Ebay. I think I got her Riley Roos on sale from a store on Zulily. Zulily is a shopping website that you have to register on. Once you get registered you can go into the site and look at the different stores and the items they have on clearnace. They stores have amazing sales but the stuff goes fast! I have also bought a few pairs at the Pacifier store, which is local, because I had Groupons for their store. I haven’t shopped outright there for shoes, but they do have a good selection of Robeez. I also bought Robeez at the hospital gift store where I had my baby! The Ecco walkers I got a consignment shop for around $20.00. I also recently found a pair of Ecco Mary Jane’s at Goodwill for $2.99. I was psyched! I bought a pair of Columbia sandals for her on Sierra Trading Post last summer. They have reduced prices on their merchandise. The brown Robeez boots I got on Ebay for a decent price. Well, anyway, happy shoe shopping with whatever brand you decide to go with. Let us know what you purchase and what has worked well for you and your child. I’ll be interested to hear from any other shoe lovers out there! Update: Just got these shoes for my three year old daughter and she LOVES them! She’s been wearing them everywhere and she can take them off and put them on herself without any help. They are made by Minnetonka Moccasin. My son’s feet are xw so that leaves us with few choices in brands. Most of the shoes we get are stride rite. When he was younger I loved the robeez syle, until the elasic started leaving red marks as his feet got so wide. I’ve found that if I look ahead a size or two I can find good shoes for him on ebay, but if I need them NOW then it’s hard to find the xw size. This post is a great resouce. Thanks! Hi Karen – I failed to mention..today, when I was on the Soft Star shoe website I noticed they have a selection for Regular or Wide. If you custom order I think you can actually even draw your child’s foot on a piece of paper and send it to them. My roommate’s little boy has REALLY wide feet! His feet are the same length as my daughter’s. When I bought the Keen’s (off of Sierra Trading Post, by the way) and got them in the mail, I immediately knew she would walk right out of them. I sold them to my roommate and now he is wearing them. They are really cute! I’ll post a picture of them above. getting knowledge everyday by reading such good posts.